In many ways, the original Ring Doorbell was the market leader in smart video doorbells. The second improves on a couple of areas that needed it, and adds customisation. There's no massive compelling reason to upgrade if you have the first generation. Ring is the trend-setter and market leader in smart, connected video doorbells. Not only do such devices provide the ability to communicate with delivery drivers when you're not at home, they're relatively affordable motion-sensing security cameras. The Ring Video Doorbell 2 looks a lot like the original device. However, there are a few very welcome additions and improvements to the sequel which ensure it remains competitive - despite Nest just having launched its own, more slim-line product. The first-generation Ring Video Doorbell was a metal clad rectangle that, as doorbells go, was fairly large. In that regard, the second-generation is the same - it's actually a tad bigger than the first. With that larger size comes a few key improvements in design and installation terms. The most important and necessary of which is the removable battery. Like the first model, you can install the bell to run on existing power from an older doorbell. But the most popular method of installation is wire-free, using power from an internal battery. In the older model, you'd have to remove the entire doorbell from its backplate in order to charge it whenever the battery ran out every few months. With the second-gen model you don't need to do that - instead, simply unscrew the faceplate from beneath the doorbell, push a level/catch that holds the battery in place, and the battery slides out. There's only one battery included as standard, so when charging you'll still be without a functioning doorbell for the few hours it takes to rejuice. However, it is possible to buy a second battery for £20 - meaning you'll not need to have any doorbell downtime. Simply swap out the empty for a full one, then leave it in place until that one depletes over a few months - yep, months - and swap them back over again. Swappable faceplates is a new feature for the Ring Doorbell 2, too, with both a silver and matte black fascias to cover the bottom portion of the doorbell (where the button and its surrounding LED light right lives). The Ring Video Doorbell 2 also ships with a couple of new mounting brackets, specifically designed to install it on tricky doors, or just to angle it in a particular way. One allows you to point the camera to the right or left at a slight angle, while the other lets you point it up or down slightly. If you're a first-gen owner who is itching to upgrade, you'll be glad to know that the second-gen ships with a mounting plate which will allow you to mount it where the first-gen model is. That means no drilling more holes into your exterior wall, or making new holes in your door frame. For new owners, installation is pretty simple: just drill four well-placed holes where you want the doorbell to live, then use the included wall plugs and screws to fix it in place. It takes very little time. The initial setup process for the Ring doorbell is very similar to any other smart device connection setup. First, download the Ring app, then press the setup button on the front of the doorbell (this is hidden by the fascia after you've got it up and running) to get the doorbell speaking with your home Wi-Fi network. The rest of the process is just customising its features to suit your preferences. As an example, you can alter how sensitive you want the motion sensor to be, with a range of five to 30 feet. You can also switch off particular zones - which is useful if you have a wall running alongside on side of the camera's view. In real-life use the Ring Doorbell 2 works as reliably as the first-generation model. Whenever it detects body heat moving within its zones, it can send a notification to your phone (if you choose for to set it up that way), and then captures around 20-seconds of footage. This works in the day and the night, thanks to night vision capabilities. However, as the device doesn't have the ability to recognise an object as a person, it often triggers an alert if a vehicle drives down your road within view of the camera. This depends mostly on the heat signature given off by the vehicle. In our case, it rarely happened with cars, and only tended to trigger the alert if it was a large truck or van. Thankfully, Ring does give you the option to schedule your motion sensor alerts. So, if you're home a lot and not worried about being burgled in broad daylight, you can change the schedule to match when you're at home. This undoubtedly helps the battery to last longer too. When someone presses the doorbell button, you can speak directly to them through the app on your phone, from anywhere in the world. Both Android and iPhone are supported natively, and there are also apps for PC and Mac. However, the latest Ring Doorbell still exhibits a noticeable delay between motion detection or the doorbell button being pressed and when a notification makes it through to your connected device. It's only a couple of seconds at most, but it's much the same as it was with the first-gen device. Also there's no in-home audio, i.e. the doorbell doesn't actually "ring", unless you buy a Chime or Chime Pro (which also acts as a Wi-Fi extender). With that said, if you have Amazon Echo devices at home, you can have notification alerts or chimes, play on those when someone presses the doorbell button and - if you have a Spot or Show - have the video feed displayed on the screen. You can see it at work in the video below. Apart from the removable battery, the other main improvement in the Ring Video Doorbell 2 is the camera. Rather than stream in 720p, this new unit captures and streams 1080p resolution video. What's more, we've noticed a huge improvement in colour saturation. The extra detail is clearly noticeable compared to the first-gen model. Which, while useful when talking to a delivery worker, is more vital if there's an uninvited person at your door, or you need footage to help a police investigation. As for the night vision camera, that's supposedly been improved as well - although we found those gains hard to detect. It still works really well, however, just as it did in the first device - if someone comes close to the Ring Doorbell in the night, it'll trigger the motion sensor and capture black and white footage. As you'd expect, you don't get the same level of detail as you would in the daytime. Especially if the person's face is quite close to the camera. In these instances, the infrared tends to blow out the face exposure, so facial details aren't as clear. A variable output based on proximity would be preferable, if plausible. Video captured from the Ring Doorbell 2 is stored in the cloud which, naturally, means a monthly subscription to access this footage. For one camera it's £2.40 per month, or £24 for 12 months. Footage is saved for 60 days, which is plenty of time to download anything notable. If you don't wish to pay the subscription then you'll still get access to the live camera feed, meaning you can still chat to your visitors remotely, but you can't watch any captured footage after the fact. With every new Ring Doorbell product a one-month free trial is included to help you decide whether you want/need the stored footage, or you just want to use it on a live-stream basis. The original Ring Doorbell was the market-leader in smart video doorbells. The second-generation looks to keep up this success by improving on a number of areas - a removable battery, 1080p capture and included mounts/fascias - but there's no significant reason to upgrade if you own the original. There are a couple of downsides too. Firstly, it's quite a big unit - which may not suit those with limited space for installation. Secondly, its performance is reliant on a good Wi-Fi network, so if your front door is nowhere near your wireless router then it might struggle to connect. A Wi-Fi extender, mesh network system or buying Chime Pro will fix this problem. 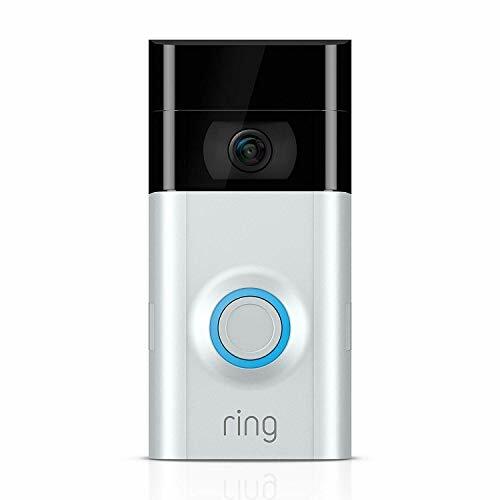 The Ring Video Doorbell is an incredibly useful device - both a method to communicate with visitors when you're not home, and as a security camera. It's not perfect, but it's convenient and can be a very useful tool to identify and catch burglars in the act.